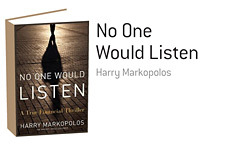 In his recently released book "No One Would Listen: A True Financial Thriller", Harry Markopolos unleashes one of the most scathing indictments of the SEC (Securities and Exchange Commission) that I have ever read. Harry Markopolos, in case you don't know, is the man who tried to bring down Bernard Madoff for nearly a decade. Despite his repeated attempts to notify the SEC of Madoff's fraud, and despite the fact that he was a HIGHLY credible source, Markopolos was never able to bring the case to the attention of the right people at the SEC. Because of the SEC's failure to act, Madoff's scheme stretched on for many more years than it should have, bilking billions more from unsuspecting investors. When I picked up "No One Would Listen", I figured that a great deal of anger would leap forth from the pages. I was right, however the anger was directed more towards the SEC and less towards Bernard Madoff (though, don't confuse things - Markopolos says that Madoff is the "lowest form of scum"). What started as a slam-dunk case against Madoff (Markopolos, using his mathematical prowess, deduced that something was fishy with Madoff within minutes of first being presented with information re: Madoff's fund), quickly turned into a fiasco. Markopolos tried MULTIPLE times over the course of an 8 1/2 year period to bring Madoff down, only to be constantly thwarted by the SEC. It was only a sharp decline in the markets that eventually brought the Madoff fraud to light - in a "Ponzi" scheme, whenever funds stop flowing in, the scheme comes to an end. Markopolos had analyzed Madoff's unbelievably consistent returns and came to the conclusion that they were fraudulent. In addition, Markopolos had dozens of people throughout the securities industry who would back up Markopolos' claims that Madoff's returns were nothing more than fantasy. Madoff even had people AT THE SEC who believed that he had a fantastic case, and that something was definitely fishy at Bernard Madoff's company. However, none of this mattered. It's not that the SEC didn't launch investigations against Madoff - they did. However, they investigated entirely the wrong things. Instead of investigating Madoff's hedge fund / "money management" operation, they investigated his (legitimate) market-making business and cited him for minor infractions. According to the book, the SEC didn't even realize that Madoff's hedge fund operation was located on an entirely different floor than the market-making portion of the company. That's how clueless they were. According to Markopolos, three of the right questions would have revealed that Madoff was a fraud, but these questions were never asked until it was too late. Markopolos is a math guy. As he says in his book, the math proved that Madoff was a fraud. There was simply no way that Madoff could be generating the consistent profits that he claimed to be generating while using the technique that he said he was using. It just didn't add up. Harry's crusade against Madoff began when his firm wanted him to try to come up with a product that would come close to mirroring Madoff's consistent gains. Markopolos' firm knew that they could make a ton of money if they were able to come up with a product that came close to matching Madoff's consistent gains. Markopolos soon came to the conclusion that these returns were impossible to duplicate using Madoff's method (split strike conversions). Later on in his career, Markopolos left his job to become a full-time fraud investigator. He was hoping to make his living by taking advantage of the SEC's bounty program, but quickly found out that the SEC really had no interest in pursuing any of the cases that he investigated. He also soon realized that the SEC had paid out an amazingly low sum of money throughout the entirety of its bounty program. Markopolos' campaign against Madoff then turned into a personal crusade - he realized that he wouldn't be entitled to any money if Madoff was taken down, but instead wanted to see Madoff arrested for the good of the investment community, and because it was the right thing to do. Harry felt as though his life was in danger because of his dogged pursuit of Madoff. He carried a gun with him at all times, and also considered wearing body armor. He chose different routes to drive home every day. He significantly upgraded his home security system in order to protect his family. He worried. He tossed and turned at night. Harry Markopolos paid the price for trying to bring down Madoff, but he didn't let that dissuade him. Eventually, thanks to a downturn in the markets, Madoff's scheme came unravelled and he went to jail. Markopolos and his team were vindicated. Something new that I learned in this book was that it wasn't Markopolos alone that was trying to bring down Madoff - he actually had a team of people helping him. So what happened? Why wasn't Madoff quickly shut down when Markopolos presented his thorough analysis of the Madoff fraud to them for the first time? 3. Too many lawyers and not enough forensic accountants and "math guys"
I'm not sure if any of these things have been rectified in the aftermath of the Madoff scandal coming to light - let's hope so. An effective SEC is vitally important to maintain the integrity of the markets. 1. How much more effective would the SEC be if there were 50-100 people like Harry Markopolos working at the agency? 2. Have any of the issues with the SEC that were brought to light in Harry's book been fixed? 3. Why does the SEC seem to be afraid of going after big companies? 4. Why doesn't the SEC hire more people who can understand the complicated world of derivatives? 5. Why doesn't the SEC have a bigger budget given their role in preserving the integrity of our markets? 6. How can a potential investigation be buried by one regional office if another believes that there is a very strong case? 7. Why doesn't the SEC pay out more money through its bounty program? This was an excellent book - many people in Harry's position would have just given up, but he stuck with it and eventually saw Madoff's fraudulent empire come crashing down. It's just too bad that the SEC didn't investigate 8 1/2 years earlier when they should have, because then billions upon billions of dollars would have been saved. Harry Markopolos gave the SEC all of the information that they could have possibly needed. All the SEC had to do was walk over to Madoff's office, step inside and ask 2-3 of the right questions. That's all it would have taken to expose Madoff. Knowing Madoff, he probably would have just given up on the spot had somebody asked the right questions and asked for verification. Instead, many more investors lost their savings, and some even lost their lives. Reading this book also makes you wonder - how many frauds have slipped through the cracks over the years due to the incompetence of the SEC?